Depression is a common and heterogeneous condition with a chronic and recurrent natural course that is frequently seen in the primary care setting. Primary care providers play a central role in managing depression and concurrent physical comorbidities, and they face challenges in diagnosing and treating the condition. In this two part series, we review the evidence available to help to guide primary care providers and practices to recognize and manage depression. The first review outlined an approach to screening and diagnosing depression in primary care. This second review presents an evidence based approach to the treatment of depression in primary care, detailing the recommended lifestyle, drug, and psychological interventions at the individual level. It also highlights strategies that are being adopted at an organizational level to manage depression more effectively in primary care. The vast majority of people with depression are treated in the primary care setting, with estimates ranging from 64% in America to 90% in the UK.12 Primary care providers have a distinct role and skill set that complement but are not substitutes for specialist mental health input.3 Most primary care providers screen for, diagnose, and treat depression and ensure routine follow-up. Even when specialist mental health input is needed, primary care providers maintain an important role in managing the chronic physical comorbidities, tackling social vulnerabilities, and monitoring psychiatric risk. Depression is broad and heterogeneous and thus can be taken to mean a multitude of different terms (fig 1). This review focuses on major depressive disorder (MDD) in primary care and does not cover the management of other depressive disorders. MDD is an umbrella term that covers the constellation of signs and symptoms that constitute a depressive episode and that place a limitation on functioning. The disorder may be graded on severity from mild, through moderate, to severe and psychotic and may present as a single episode or be recurrent. 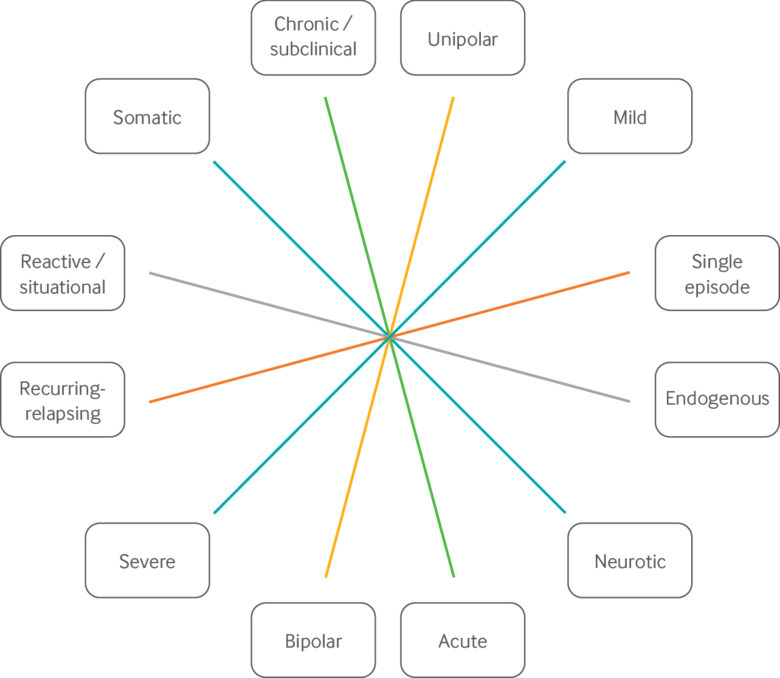 As outlined in the first review of this series,4 MDD commonly occurs with other emotional, substance use, and physical disorders that should be considered when deciding on interventions. We have not detailed here specific treatment strategies adapted to each potential comorbidity. We have, however, emphasized the need to consider the presence of comorbidities when screening for and diagnosing depression in primary care and included, where appropriate, a discussion on interventions known to be effective for patients with such comorbidities. We also have not included specific interventions for subclinical chronic depression (also called dysthymia or dysthymic disorder) or for subtypes of depression such as bipolar depression, perinatal depression, or seasonal affective disorder. Given this natural course, depression in primary care should be managed as any other chronic disease.11 Management requires a clear treatment pathway and the use of evidence based strategies for individual primary care providers supported by organizational strategies at the practice level. To collect and review the evidence available on depression in primary care, we searched the PubMed and Cochrane databases for relevant articles published between 1 January 2007 and 30 September 2017 by using medical subject headings (MeSH) terms including “depressive disorder”, “depression”, and “major depressive disorder” in combination with “primary care” and “general practice”. We did individualized searches for specific interventions thought relevant through the review process. We limited our search to the English language. We reviewed titles and abstracts, excluding publications not relevant to primary care or for which MDD was not the main focus of the study. We then used a pragmatic prioritizing framework to determine which studies to include in the review. This incorporated the level of evidence, with systematic reviews and meta-analyses given priority and interventional studies prioritized over observational studies; recency, with more recent studies prioritized over older studies; and sample size, with larger studies prioritized over those with smaller sample sizes. Where competing priorities existed—for example, a more recent smaller interventional study with similar objectives to a larger but older randomized controlled trial (RCT), we assigned priority by consensus between the authors on the basis of the methodology, study population, aims of the study, and outcome measures. In addition, we searched the reference lists of included studies for further relevant studies. If a study had been conducted before our search timeframe of the past 10 years, we considered it for inclusion if we deemed it important by virtue of its size or methodology or the absence of other research conducted in the area. References to older, but noteworthy, validation studies were made as appropriate. Many psychological, pharmacological, and psychosocial interventions, either alone or in combination, are available to treat a person diagnosed as having depression. Although evidence on the comparative effectiveness of treatments within and between the different classes of interventions is limited,22 two comparative reviews of psychological and drug treatments concluded that they are of comparable efficacy in primary care.2324 Different guidelines recommend different initial management options. For example, the National Institute for Health and Care Excellence (NICE) in England recommends avoiding antidepressant drugs for mild depression and combining drug treatment with psychotherapy for more severe forms of depression.25 The guidelines of the Royal Australian and New Zealand College of Psychiatrists suggest that psychological management may be sufficient for depression of mild to moderate severity and recommend using antidepressants when this fails or in severe depressive disorder,26 whereas American guidelines (both of the American College of Physicians and of the Institute for Clinical Systems Improvement, the latter having published guidelines specifically for the management of depression in primary care)2728 suggest that drug treatment and psychotherapy can be considered equivalently for initial treatment. As the comparative effectiveness of one intervention over another for the treatment of depression is limited, an individual patient’s personal preferences and circumstances should be considered alongside the clinical evidence. Treatment choice should, therefore, ideally be informed by a shared decision making (SDM) approach, in which the clinician and the patient, informed about the range of options available, arrive at a healthcare choice together. A cluster randomized controlled trial in 2015 of 117 patients and 301 primary care clinicians found that the use of a decision aid improved satisfaction with the decision between clinicians and patients, reducing conflict, and improved patients’ knowledge about treatment options without affecting the duration of the clinical encounter. 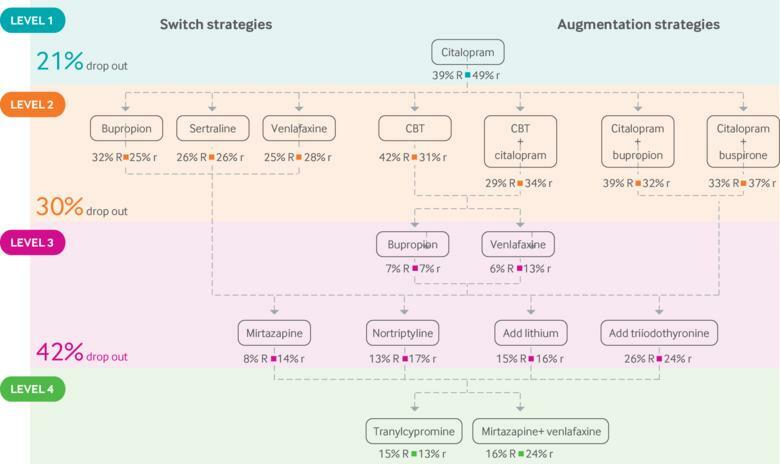 The decision aid had no effect on clinical outcomes or adherence to drug treatment.31 However, the time for the consultation in both intervention and control groups was 40 minutes, so more practicable approaches to SDM in primary care need to be studied. Psychological interventions have long been established as treatments for relieving or reducing depressive symptoms.333435 Recent decades have seen increasing diversification in the theory and practice of psychological treatments into a variety of individual, group, short term, and long term options.36 For the purposes of this review, we concentrate on therapies that can be feasibly delivered in primary care settings, defined as those that are time limited, require fewer resources, and lend themselves to being put into practice (table 1). These include low intensity treatments that are brief and have minimal (or sometimes no) input from a trained professional, such as guided self help, computerized cognitive behavioral therapy (cCBT), and psychological counseling, as well as high intensity treatments that are delivered face to face by a qualified psychotherapist in group or individual settings and include cognitive behavioral therapy (CBT), interpersonal therapy, behavioral activation, and short term psychodynamic psychotherapy (STPP). Several systematic reviews have found little or no difference in the effectiveness of different modalities of brief, time limited therapies—either low or high intensity—compared with longer term interventions such as long term psychoanalytic or psychodynamic approaches.56575859606162 A large meta-analysis of 30 studies covering 5159 participants with a range of depressive conditions from chronic subthreshold depression to MDD in the primary care setting found effect sizes in the small to moderate range for a variety of psychological therapies.62 Standardized mean differences ranged from –0.24 (95% confidence interval –0.47 to –0.02) for face to face interpersonal therapy and –0.30 (–0.40 to –0.13) for face to face CBT to –0.40 (–0.69 to –0.11) for guided self help (where a negative number favors the intervention). Until recently, the potential for CBT to be provided online, without regular guidance from a trained psychologist, had garnered mixed results through RCTs. However, in 2017, a meta-analysis of self guided, internet based CBT using individual participant data of 3876 participants from 13 studies found that self guided internet CBT was significantly more effective than controls for treatment response (odds ratio 1.95, 1.52 to 2.50; number needed to treat 8).45 Adherence to treatment was associated with greater response (β=0.90; P<0.001). In contrast, unstructured psychological interventions such as self help and generic counseling have been found to be less effective when delivered in the absence of a therapist or with minimal therapeutic contact. Overall, the evidence suggests that non-specific factors such as the therapeutic relationship and the client’s expectations are very important for the outcome of most therapies, particularly in low intensity, unstructured interventions such as generic counseling or self help, and that this therapeutic relationship can be maintained through remote technologies. Moreover, emerging evidence shows that for highly structured interventions such as CBT, the therapy may be delivered in a highly manualized form, without the influence of a therapist, and so may be a useful first step for people with mild to moderate depression in primary care. Although there is a dearth of research on the possible harms of psychological interventions,6869 these interventions are not without risk. One recent study found that 1 in 20 people reported lasting adverse effects based on a national survey of 14 587 respondents who had received psychological treatments for anxiety or depression in England.70 The survey did not qualify the types of adverse effects, but the separate development of a recently validated questionnaire to identify the negative effects of psychological treatments (the Negative Effects Questionnaire) found that the most common harms reported were resurfacing of unpleasant memories (38%), increased lasting stress (38%), and increase in anxiety (37%).71 The impact of these adverse effects is not known, but primary care providers should make patients aware that anxiety may increase on starting therapy before improvement in depressive symptoms is achieved. Prescription of antidepressants worldwide is increasing.72 A retrospective analysis of antidepressant prescribing trends in UK primary care in 2016 found that whereas the rate of antidepressant prescribing increased from 61.9 per 1000 person years in 1995 to 129.9 per 1000 person years in 2011, the incidence of new prescriptions did not (21.3/1000 person years in 1995; 17.9/1000 person years in 2011).73 Therefore, upward trends in primary care may be better explained by the longer use of antidepressants rather than an increase in new prescriptions. This may reflect the growing awareness of depression as a chronic or relapsing-remitting disorder, similar to other long term conditions such as hypertension, diabetes, or asthma, and, as for those conditions, drug intervention should be titrated according to routine and regular monitoring. Until recently, several systematic reviews had not been able to establish firm conclusions on the efficacy or tolerability of one antidepressant (any SSRI, duloxetine, mirtazapine, venlafaxine) over another.76777879808182 However, in 2018, a large network meta-analysis comparing 21 antidepressants with placebo or another antidepressant in adults with MDD found comparative differences.83 The review included 522 double blind RCTs (116 477 participants) and, importantly, included a substantial volume of unpublished data. All antidepressants were more effective than placebo for both remission and response, with amitriptyline, mirtazapine, duloxetine, venlafaxine, and paroxetine being the most efficacious (range of odds ratios 1.75-2.13 for response) and clomipramine, trazadone, citalopram, fluoxetine, and bupropion being least effective (1.49-1.58 for response). Agomelatine, fluoxetine, and escitalopram were better tolerated than other antidepressants (range of odds ratios 0.43-0.77), whereas amitriptyline, duloxetine, trazadone, and venlafaxine had the highest dropout rates (1.30-2.32). Tricyclic antidepressants have adverse cardiovascular and anticholinergic effects and are particularly toxic in overdose, limiting their use.96 SSRIs tend to have a more benign side effect profile (except in older adults; see below). The most common side effects are headache and gastrointestinal symptoms.97 As previously noted, depression is highly comorbid with other conditions, both behavioral and physical, and the risks associated with polypharmacy and antidepressants is an important concern in primary care, particularly in older adults. SSRIs also significantly increase the risk of gastrointestinal, and possibly cerebrovascular, bleeds in older adults,103 although the odds are modest (odds ratio 1.66, 1.44 to 1.92 for upper gastrointestinal bleeding) except when combined with other high risk drugs (for example, non-steroidal anti-inflammatory drugs: odds ratio 4.25, 2.82 to 6.42).104 Taken together, these findings suggest that primary care providers should use antidepressants, and particularly the SSRIs, with caution in older adults and possibly at lower doses and with more active monitoring for side effects. Physical activity seems to have the strongest evidence base, although further high quality research is needed before it can be recommended as a standalone treatment, even in mild depression. Despite this, primary care providers have an important role in supporting the overall health and wellbeing of patients, many of whom have multiple comorbidities. As such, lifestyle modifications can be an important approach to patient centered care more generally. The approach to the management of depression when the first intervention fails was established by the Sequenced Treatment Alternatives to Relieve Depression (STAR*D) trial, one of the largest RCTs in mental illness research (n=2876).127 This set a landmark in proposing the treatment of next choice for people with depression. Over seven years, a series of pragmatic RCTs were conducted to evaluate various drug treatments and CBT as augmentation or switching strategies for patients who did not respond to citalopram (chosen as the index antidepressant) (fig 2). The study design limited the randomization of participants at each level of the process to only his/her range of acceptable treatments in an effort to reflect clinical practice accurately. Participants had to have at least moderate depression as measured on the Hamilton Depression Rating Scale. The primary outcome was remission, with response, defined as an improvement of 50% from baseline, as a secondary outcome.128 About a third of participants achieved remission with citalopram and a further 10-15% responded but did not reach remission. At the second level, about 25% of participants recovered. Primary care providers may not feel comfortable managing depression by using all the steps trialed in STAR*D—for example, augmentation with lithium or triiodothyronine or the use of tranylcypromine. Most guidelines and professional organizations such as the American Association of Family Physicians have suggested inviting specialist input after two failed interventions in depression (often taken to signify treatment resistance in depression).129 Given the complexities of managing treatment resistant depression (TRD) in primary care, we support this recommendation. However, individual providers may need to balance these recommendations against ease of access to specialists and other barriers to referral. However, primary care providers still play an important role in the assessment and management of TRD. Firstly, they can help in distinguishing treatment resistance from inadequate treatment. Multiple studies have found non-adherence to antidepressants to be as high as 40-50% in community samples.145146147 Some evidence suggests that most patients considered to have TRD in primary care have not had drugs prescribed at the recommended doses or for the recommended length of time or have not taken them as prescribed.148 Secondly, primary care providers help in monitoring the effect and some of the side effects of commonly used treatment strategies such as augmentation with lithium or antipsychotics. The management of depression in the primary care setting is often suboptimal, and evidence suggests that as few as 20-40% of older adults with depression or dysthymic disorder prescribed treatment for depression in primary care show substantial clinical improvements at 12 months.151 Time constraints, conflicting demands, and diverging priorities are major barriers to primary care providers effectively treating depression.152 Thus, to meet the needs of patients and the expectations for implementing evidence based approaches to care, primary care providers will need to be better prepared to diagnose and treat depression and, perhaps more importantly, be supported by a practice infrastructure that adapts the functionality of the chronic care model. Purchasers and policy makers will also need to develop and implement policies that support and incentivize these structures and activities in the primary care setting. Importantly, the consistent use of a measurement based care (MBC) approachto management of depression in the primary care setting has emerged as a strategic approach that involves patients in the decision making process and assures that they do not “fall through the cracks.”162 MBC, defined as enhanced precision and consistency in disease assessment, tracking, and treatment to achieve optimal outcomes,163 is an approach that has been used universally in the chronic medical disease management model and offers great potential for the management of depression in primary care. MBC has several key features, which are summarized in box 2. MBC, however, is not without its limitations, and critics cite concerns about a focus on measurement,potentially at the expense of the doctor-patient relationship.164 An MBC approach should complement the primary care professional’s clinical judgment, and, as with treating any chronic illness, working with patients to improve their adaptive and problem solving skills as well as their capacity for self management and self monitoring should also be a priority.Primary care professionals play an important role in creating a positive experience of careoverall, and they must establish a therapeutic alliance with patients, as well as with families and caregivers. These findings support the growing recognition that structural changes within a practice are often needed to appropriately manage depression in primary care. In many ways the CCM operationalizes the MBC approach through three core processes (box 3).135 The CCM can improve physical and mental health outcomes in primary care with little to no net health costs.168 However, it has not been adopted widely outside well resourced or academic centers, as successful implementation requires alignment of financial incentives to support system redesign, adequate funding to sustain change, and adaptation to local contexts and practices.169170 New evidence from qualitative systems-wide analysis has shown that a multitude of structural factors (for example, co-location of care, electronic infrastructure), processes (team working, care coordination, quality outcome measurement), external contexts (reimbursement, licensing arrangements), and internal factors (organizational culture) interact with each other to either facilitate or hinder effective delivery of mental healthcare in primary care.171 Integration of primary care and specialist mental healthcare can therefore be considered a product of transformative change that is dependent on internal and extra-organizational systems and contexts. In addition to preparing providers to apply appropriate clinical strategies at the primary care level and building a practice infrastructure, it is important to establish a set of connections with behavioral health specialists and other resources in the community, along with policies that promote and encourage better outcomes for patients. Primary care practices should have a network of trusted and reliable specialist partners that can provide both formal and informal consultation, as well as ongoing care for more complex or treatment resistant patients whose needs extend beyond the practice’s capacity. Ideally, these partnerships should be characterized by having formalized agreements that specify respective responsibilities, assure access, provide “greased” referral mechanisms, include information sharing arrangements, and detail any financial expectations. Effective care often involves tackling the key social determinants of health, along with behavioral health conditions. Thus, it is important to foster effective linkages to housing, vocational, and other supportive social services and to community organizations and resources, and for relevant social determinants to be incorporated into care plans. New and emerging interventions have been, or are in the process of being, developed in psychotherapy, pharmacotherapy, and physical treatments for the management of depression. Most of these are still used principally in experimental or specialist settings, but they may become more widespread in the future. Primary care providers should generally be aware of the growing interest in the use of non-invasive physical procedures such as repetitive transcranial magnetic stimulation (rTMS) to manage depression. A powerful electromagnet is placed on the scalp and produces electrical currents in specific cortical and subcortical structures of the brain. Most of the literature has assessed its efficacy in TRD, in which good evidence shows that it performs better than sham treatment. A meta-analysis of 81 RCTs (4233 participants) found that rTMS was significantly more effective than sham treatment for response, acceptability, and remission (odds ratios varied from 2.48 and 4.95 depending on the location of the nodes and intensity of the rTMS being delivered).180 However, rTMS did not outperform any active comparators, replicating previous findings that it is not superior to other treatments for TRD such as electroconvulsive therapy.194195 Primary care professionals should, therefore, advise patients that it may benefit some patients with TRD, but not all, and there is not enough evidence to support its use as monotherapy. Effective management of depression in primary care requires strategies at the individual and organizational level. Table 3 shows our recommendations. At the individual level, choosing the most suitable intervention depends on clinical and person specific factors, including relative benefits and harms, interactions with other conditions or interventions, previous response, and the patient’s preference. Treatment choice should be considered a collaborative venture in which the most preferable intervention is chosen according to the patient’s circumstances and preferences. Collaboration is also needed within the wider system. Adequately training primary care providers in the recognition and treatment of depression and mechanisms to facilitate efficient working practices between specialist and primary care services (such as routine measurement based care) can support primary care professionals to better help their patients with depression. For relatively mild forms of depression, how can patients and their primary care providers differentiate who should receive “watchful waiting” (that is truly watchful, consistent with measurement based care) and who should receive active intervention? How can primary care professionals determine to which drugs a patient is most likely to respond? To which psychological therapy? To which combination of the two? How can primary care professionals differentiate patients who may develop manic symptoms in response to antidepressant treatment? What are the most effective strategies in treating treatment resistant depression? Given the bidirectional impact of depression and social, employment, educational, and economic outcomes, how can primary care professionals best integrate interventions across healthcare and social service settings? What are the best ways to train, support, and incentivize healthcare professionals to recognize, understand, and effectively treat depression? We sought feedback from several different sources in compiling and modifying our reviews. Members of the Wellbeing Network Hounslow Community who live with depression in west London gave us feedback on the written manuscripts. They placed a particular emphasis on being actively listened to by their general practitioners (GPs) when presenting with depression and for GPs to take a holistic view of their condition. Patients wanted to feel included in treatment decisions and to be able to build trusting relationships with their GP. Self management strategies, supportive therapy, and, when needed, targeted psychotherapy were held in high regard. Many people commented on the lack of time GPs had and the need for specific training on assessing and managing mental health needs, especially when co-occurring with other illnesses such as anxiety disorders or physical conditions. Members of the Ealing Primary Care Mental Health Services Service Users Forum also shared insights from their care being transferred from specialist to primary care services in England. Common themes included adjusting to the reduced frequency of contact in primary care (compared with specialist services); how to access care, particularly in crisis; and the level of mental health training available to primary care professionals. Care coordination functions and a single point of contact were frequently proposed solutions to some of these difficulties. *Written permission to use this quote has been granted by the subject.
. Depression in primary care: part 1—diagnosis and assessment. BMJ2019;265:l794.
. Control of depression improves quality of life in community-dwelling older adults with mild physical disability. Int J Phys Med Rehabil2017;5:389doi:10.4172/2329-9096.1000389 .
. Depression in adults: treatment and management.NICE, 2017.
. Practice guideline for the treatment of patients with major depressive disorder.3rd ed. APA, 2010.
. Depression, adult in primary care.17th ed. ICSI, 2016.
. Toward effective counselling and psychotherapy.Aldine Publishing Company, 1967.
. A behavioral approach to depression. In: Katz MM, ed. The psychology of depression: contemporary theory and research.Wiley, 1974: 157-85.
. Cognitive therapy of depression.Guildford Press, 1979.
. What Are Counselling and Psychotherapy? BACP Information Sheet C2.British Association for Counselling and Psychotherapy, 2016.
. What works for whom? A critical review of psychotherapy research.Guildford Press, 2013.
. Research summary of the therapeutic relationship and psychotherapy outcome. Psychotherapy2001;38:357-61doi:10.1037/0033-3204.38.4.357 . Sertraline versus other antidepressive agents for depression. Cochrane Database Sys Rev2010;(4):CD006117.
. Depression and Anxiety. In: The Maudsley Prescribing Guidelines in Psychiatry.13th ed. John Wiley & Sons, 2018: 358-60. Working Group of the Clinical Practice Guideline on the Management of Depression in Adults. Clinical Practice Guideline on the Management of Depression in Adults. Ministry of Health, Social Services and Equality. 2014. http://www.guiasalud.es/contenidos/GPC/GPC_534_Depresion_Adulto_Avaliat_compl_en.pdf.
. Maintenance pharmacotherapy of unipolar depression. Psychiatr Bull1999;23:370-3doi:10.1192/pb.23.6.370 .
. Insomnia as a risk factor for depression. Int J Neuropsychopharmacol2004;7:S34-5.
. Decreasing loneliness and social isolation among the older people: systematic search and narrative review. Epidemiol Biostat Public Health2017;14(Suppl 1):e12408.
. Preventing social isolation and loneliness among older people: a systematic review of health promotion interventions. Ageing Soc2005;25:41-67doi:10.1017/S0144686X04002594 . American Psychiatric Association, Academy of Psychosomatic Medicine. Dissemination of integrated care within adult primary care settings: the Collaborative Care Model. 2016. https://www.integration.samhsa.gov/integrated-care-models/APA-APM-Dissemination-Integrated-Care-Report.pdf.
. Adherence to antidepressants: a review of the literature. Neuropsychiatry2016;6:236-41doi:10.4172/Neuropsychiatry.1000145 . SAMSHA-HRSA Center for Integrated Health Solutions. Education and training. https://www.integration.samhsa.gov/workforce/education-training.
. Improving the recognition and management of depression in primary care. Eff Health Care2002;7:1-12.
. Advancing integration of behavioral health into primary care: A continuum-based framework.United Hospital Fund, 2016.